This article is about nuclear physics and nuclear engineering. For the topic in geology, see Fissility (geology). For other uses, see Fission (disambiguation). 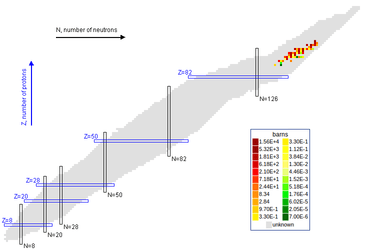 Chart of nuclides showing thermal neutron fission cross section values. Increased fissility of odd–neutron isotopes is apparent. Grey boxes represent uncharacterized isotopes. In nuclear engineering, fissile material is material capable of sustaining a nuclear fission chain reaction. By definition, fissile material can sustain a chain reaction with neutrons of any energy. The predominant neutron energy may be typified by either slow neutrons (i.e., a thermal system) or fast neutrons. Fissile material can be used to fuel thermal-neutron reactors, fast-neutron reactors and nuclear explosives. "Fissile" is distinct from "fissionable." A nuclide capable of undergoing fission (even with a low probability) after capturing a high energy neutron is referred to as "fissionable." A fissionable nuclide that can be induced to fission with low-energy thermal neutrons with a high probability is referred to as "fissile." Although the terms were formerly synonymous, fissionable materials include also those (such as uranium-238) that can be fissioned only with high-energy neutrons. As a result, fissile materials (such as uranium-235) are a subset of fissionable materials. Uranium-235 fissions with low-energy thermal neutrons because the binding energy resulting from the absorption of a neutron is greater than the critical energy required for fission; therefore uranium-235 is a fissile material. By contrast, the binding energy released by uranium-238 absorbing a thermal neutron is less than the critical energy, so the neutron must possess additional energy for fission to be possible. Consequently, uranium-238 is a fissionable material but not a fissile material. An alternative definition defines fissile nuclides as those nuclides that can be made to undergo nuclear fission (i.e., are fissionable) and also produce neutrons from such fission that can sustain a nuclear chain reaction in the correct setting. Under this definition, the only nuclides that are fissionable are those nuclides that can be made to undergo nuclear fission but produce insufficient neutrons, in either energy or number, to sustain a nuclear chain reaction. As such, while all fissile isotopes are fissionable, not all fissionable isotopes are fissile. In the arms control context, particularly in proposals for a Fissile Material Cutoff Treaty, the term "fissile" is often used to describe materials that can be used in the fission primary of a nuclear weapon. These are materials that sustain an explosive fast nuclear fission chain reaction. does not sustain a nuclear chain reaction. also makes a significant contribution to the power output of some fast-neutron reactors. In general, most actinide isotopes with an odd neutron number are fissile. Most nuclear fuels have an odd atomic mass number (A = Z + N = the total number of nucleons), and an even atomic number Z. This implies an odd number of neutrons. Isotopes with an odd number of neutrons gain an extra 1 to 2 MeV of energy from absorbing an extra neutron, from the pairing effect which favors even numbers of both neutrons and protons. This energy is enough to supply the needed extra energy for fission by slower neutrons, which is important for making fissionable isotopes also fissile. More generally, nuclides with an even number of protons and an even number of neutrons, and located near a well-known curve in nuclear physics of atomic number vs. atomic mass number are more stable than others; hence, they are less likely to undergo fission. They are more likely to "ignore" the neutron and let it go on its way, or else to absorb the neutron but without gaining enough energy from the process to deform the nucleus enough for it to fission. These "even-even" isotopes are also less likely to undergo spontaneous fission, and they also have relatively much longer partial half-lives for alpha or beta decay. Examples of these isotopes are uranium-238 and thorium-232. On the other hand, nuclei with an odd number of protons and an odd number of neutrons (odd Z, odd N) are usually short-lived (a notable exception is neptunium-236 with a half-life of 154,000 years) because they readily decay by beta-particle emission to their isobars with an even number of protons and an even number of neutrons (even Z, even N) becoming much more stable. The physical basis for this phenomenon also comes from the pairing effect in nuclear binding energy, but this time from both proton–proton and neutron–neutron pairing. The relatively short half-life of such odd-odd heavy isotopes means that they are not available in quantity and are highly radioactive. Fissile nuclides do not have a 100% chance of undergoing fission on absorption of a neutron. The chance is dependent on the nuclide as well as neutron energy. For low and medium-energy neutrons, the neutron capture cross sections for fission (σF), the cross section for neutron capture with emission of a gamma ray (σγ), and the percentage of non-fissions are in the table at right. ↑ The fissile rule thus formulated indicates 33 isotopes as likely fissile: Th-225, 227, 229; Pa-228, 230, 232; U-231, 233, 235; Np-234, 236, 238; Pu-237, 239, 241; Am-240, 242, 244; Cm-243, 245, 247; Bk-246, 248, 250; Cf-249, 251, 253; Es-252, 254, 256; Fm-255, 257, 259. Only fourteen (including a long-lived metastable nuclear isomer) have half-lives of at least a year: Th-229, U-233, U-235, Np-236, Pu-239, Pu-241, Am-242m, Cm-243, Cm-245, Cm-247, Bk-248, Cf-249, Cf-251 and Es-252. Of these, only U-235 is naturally occurring. It is possible to breed U-233 and Pu-239 from more common naturally occurring isotopes (Th-232 and U-238 respectively) by single neutron capture. The others are typically produced in smaller quantities through further neutron absorption. ↑ Ronen Y., 2006. A rule for determining fissile isotopes. Nucl. Sci. Eng., 152:3, pages 334-335. ↑ Ronen, Y. (2010). "Some remarks on the fissile isotopes". Annals of Nuclear Energy. 37 (12): 1783–1784. doi:10.1016/j.anucene.2010.07.006. ↑ "Slides-Part one: Kinetics". UNENE University Network of Excellence in Nuclear Engineering. Retrieved 3 January 2013. ↑ "Interactive Chart of Nuclides". Brookhaven National Laboratory. Retrieved 2013-08-12.